The purpose of this Sample Question Set is to provide you with information about the Dell EMC Cloud Infrastructure Specialist for Cloud Architects exam. These sample questions will make you very familiar with both the type and the difficulty level of the questions on the E20-020 certification test. To get familiar with real exam environment, we suggest you try our Sample Dell EMC Cloud Infrastructure Specialist Certification Practice Exam. This sample practice exam gives you the feeling of reality and is a clue to the questions asked in the actual Dell EMC Certified Specialist - Cloud Architect - Cloud Infrastructure (DECS-CA) certification exam. These sample questions are simple and basic questions that represent likeness to the real Dell EMC E20-020 exam questions. To assess your readiness and performance with real time scenario based questions, we suggest you prepare with our Premium Dell EMC Cloud Infrastructure Specialist Certification Practice Exam. When you solve real time scenario based questions practically, you come across many difficulties that give you an opportunity to improve. 01. During an assessment for an organization's cloud design, a cloud architect discovers that developers will be creating applications that will self-scale based on an internal trigger. The architect has included cloud management platform components in the design that will support this requirement. To meet this requirement, what else should the cloud architect consider? 02. When collecting log information from cloud management platform (CMP) components, for which cloud feature is data isolation a specific concern? 03. A cloud design contains multiple hosts that are running a hypervisor. Each host has only two physical 10Gb network adapters. Each host will support numerous virtual machines that will be connected to any of the 40 VLANs that are defined in the physical infrastructure. These virtual machines will communicate with other virtual machines on the same VLAN. How must the access layer switch ports be configured for each host? 04. What are some common inter-cloud connectivity methods for linking layer-2 network segments in hybrid cloud deployments? 05. An architect is designing a cloud. The architect wants to provide static and dedicated resources to the management applications without affecting the efficiency of consumer resource sharing. How can this be accomplished in the cloud design? 06. To which infrastructure resources and cloud services are a consumer-accessible SDN solution likely to need controlled access? 07. An organization wants to deploy virtual machines from a service catalog. These virtual machines have software and libraries installed that are used to develop applications. Each virtual machine will be configured with the same IP address and receive OS patches from the Internet. What will be included in the design to support these capabilities? 08. Which characteristics of open source cloud management components might lead a cloud architect to select open source over proprietary software? 09. You are creating a cloud infrastructure design for an organization. The cloud design includes physical servers with hypervisors which will be used to host consumer services. The hosts are managed through a hypervisor element manager. Which step should be taken to secure the hypervisor environment? 10. A cloud architect is designing a hybrid cloud for an organization. A requirement for this environment is for federated access to both cloud provisioning APIs. What must be configured between both cloud providers' authentication mechanisms? 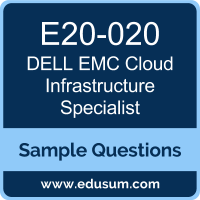 Note: For any error in Dell EMC Certified Specialist - Cloud Architect - Cloud Infrastructure (DECS-CA) (E20-020) certification exam sample questions, please update us by writing an email on feedback@edusum.com.